Composed by Carlos Posadas. 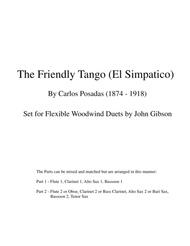 Arranged by John Gibson. For Flute,Oboe,Clarinet,Bassoon,Saxophone. Latin. Intermediate. Score,Set of Parts. Published by JB Linear (S0.36557).